As Next-Generation Sequencing is taking off in the clinic, it creates a significant data management issue for clinicians, scientists and IT professionals alike. How can we retain the massive amounts of data coming out of clinical pipelines in a way that enables labs to systematically build a knowledge base, capturing the insights clinicians gain on a day to day basis while analyzing the genetic information of their patients? What infrastructure is required to alert medical personnel of new research that could potentially alter medical decisions? And how can we embed the work that is being done in the labs into the general hospital workflows? Data warehousing is a pivotal technology that can help in all of these areas. 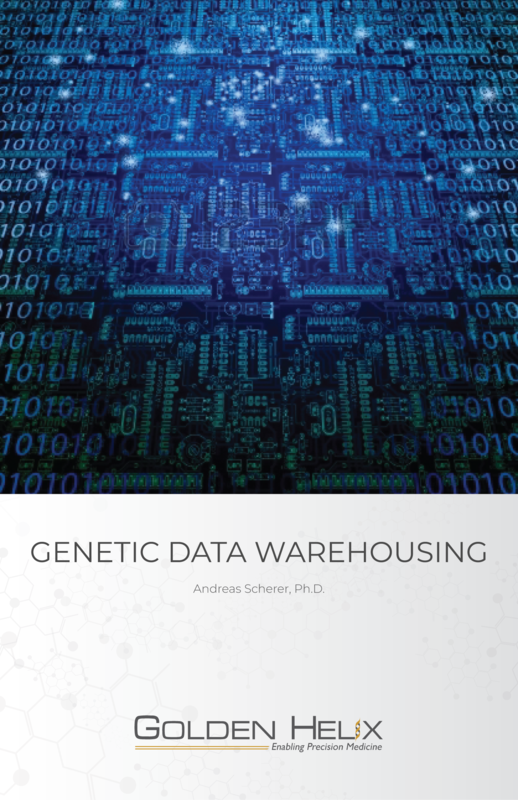 In this book, I will explain the concept of Data Warehousing and discuss the use cases for this technology vis-a-vis the upcoming requirements in clinical labs that are implementing Precision Medicine. Complete the form below and we will email you a copy right away. Stay updated with exclusive eBooks, timely invitations to webcasts and events, andother communications from Golden Helix. By submitting this form you are giving Golden Helix, Inc. permission to send additional emails. NOTE: If a form does not appear, an internet setting may be blocking it. In this case, please email us with your interest here. Dr. Andreas Scherer Dr. Andreas Scherer is CEO of Golden Helix. The company has been delivering industry leading bioinformatics solutions for the advancement of life science research and translational medicine for over a decade. Its innovative technologies and analytic services empower scientists and healthcare professionals at all levels to derive meaning from the rapidly increasing volumes of genomic data produced from microarrays and next-generation sequencing. With its solutions, hundreds of the world’s top pharmaceutical, biotech and academic research organizations are able to harness the full potential of genomics to identify the cause of disease, improve the efficacy and safety of drugs, develop genomic diagnostics and advance the quest for personalized medicine. Golden Helix products and services have been cited in over 1100 peer-reviewed publications. He is also Managing Partner of Salto Partners, a management consulting firm headquartered in the DC metro area. He has extensive experience successfully managing growth as well as orchestrating complex turnaround situations. His company, Salto Partners, advises on business strategy, financing, sales and operations. Clients are operating in the high tech and life sciences space. Dr. Scherer holds a PhD in computer science from the University of Hagen, Germany, and a Master of Computer Science from the University of Dortmund, Germany. He is author and co-author of over 20 international publications and has written books on project management, the Internet and artificial intelligence. His latest book, “Be Fast Or Be Gone”, is a prizewinner in the 2012 Eric Hoffer Book Awards competition, and has been named a finalist in the 2012 Next Generation Indie Book Awards!